Classic COWHIDE suede leather wedge sandals espadrille shoes with traditional handmade counter for toddler girls and mums too. New Nobuck leather Menorquina sandal shoes with rear strap and with stitching and soles in contrast. New Classic Little Mary Jane shoes ANGEL STYLE with perforated design in patent leather for little girls. New Classic Little Mary Jane shoes with buckle fastening and perforated design in RED patent leather for little girls. METAL Classic Nappa Leather little Mary Jane shoes with button for little girls. 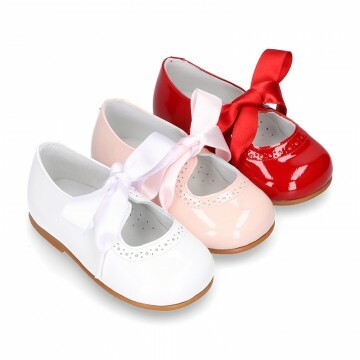 Little T-Strap shoes with perforated design and buckle fastening in patent leather for little kids in pastel colors. GLITTER classic stylized little Mary Jane shoes with velcro strap and button for girls. Little T-strap Mary Jane shoes in patent leather with pastel colors and perforated design for girls. 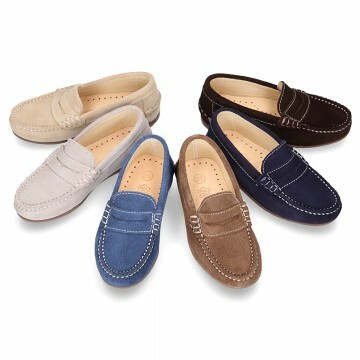 Suede leather moccasins shoes with detail mask and driver type outsole for toddler boys and dads too. SIZING LARGE. 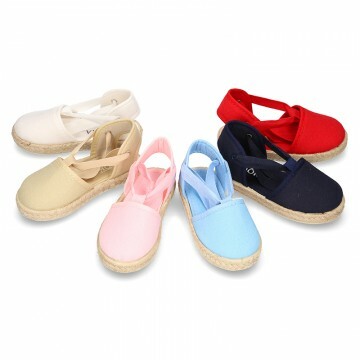 Combined Suede leather with canvas tenis shoes with VELCRO strap for little and toddler boys. New SOFT suede leather little Mary Jane shoes angel style with ties closure in METAL colors for girls. New LINEN canvas Little Laces up shoes with ties closure to dress for little kids. Hola! be very welcomed to OKAASPAIN! We invite you to discover our brand. We´d love to show you our creations, carefully conceived for you and your loved ones. Our designs are original, casual and pretty comfortable. Since beauty begins in small things, our shoes are also a way of expression. We are a passionate team with everything we do, and we want to say thank you. We want you to feel like home, like this was your own shop. Every shoe on display has been created to offer plenty of comfort, to be versatile, long lasting and highly durable. This is truly remarkable for our shoes designed for kids, who are always full of energy and life!. Moreover, we know footwear means health. That's why we want you to try us, that you and your loved ones can enjoy shoes which perfectly adapt to every foot, in other words shoes delicious to wear on. Although we travel half the city, we will feel the sensation of walking on grass on a sunny morning. In Okaaspain we´re always thinking about your children´s needs as well as yours. So, our catalog is full of options for every kind of activity and event. And of course, always with the highest quality standards which always characterized us. Don´t hesitate to take a look, our prices are just amazing! You´ll have superb quality shoes at home, together with great high quality, design, comfort and durability features at a very low price. Thanks to a business model which eliminates superfluous costs, intermediaries and those expenses that are not the ones that matter, you´ll get what you want: the product. You will be able to surf throughout these pages and review all the available collections. The options are many: Little Mary Jane shoes, loafers, moccasins, boots, safari boots, ballerina shoes, sneakers, slippers, menorquinas shoes, school shoes, sandal shoes, ... For every occasion and activity! First of all, we have to state that buying in Okaaspain.com is absolutely 100% safe. If you don´t like us, there´s no problem! If your kid is not sure, there´s no problem also!. And if the color doesn´t match with the clothes for the special day, don't worry about it!. We´ll process and manage your return and refund totally free of charges!. Shippings, changes and returns and refunds are free in the Iberian Peninsula and the Balearic Islands, and there´s no minimum order. 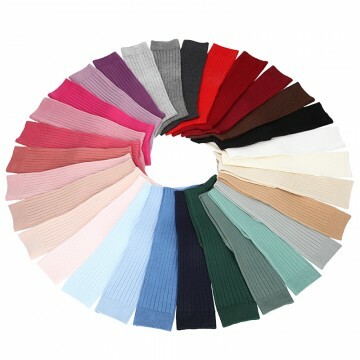 Furthermore, all the buying process is perfectly protected and secured. All the advantages of buying in a physical store, together with the comfort and warmth of your home! On the other hand, we want to give you the guarantee and 100% confidence that our product is 100% Made in Spain. The good quality above all. 4 years ago, we made a promise: we wanted Spanish footwear, one of the bests in the world (if not the best) to recover a main role in the lives of many people. We're delighted that you're here. That means that, step by step, more and more people like you find us and trust in us. Please take your time to look around our site and catalog and should you have any question, doubt our just want to expand the information, we´ll be happy to get in touch with you and help you with anything you may need. We really thank your visit to OKAASPAIN. We sincerely hope like it a lot!.